This simple, tasty and easy dosai is a special one for me. It is my mother’s favorite dish and probably the only one she made for herself exclusively. I remember there were days when my brother and I would want to order in and dad was having dinner out or the rare days when mom simply gave up on us and decided she has had enough. 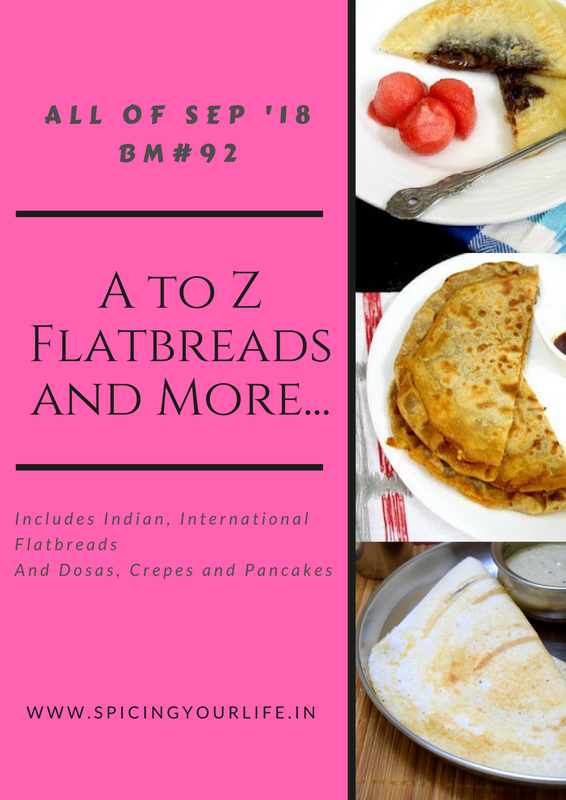 She would reach out to the ever present dosa batter in the refrigerator and pull out a cast iron pan and make this dosai for herself and settle down to relish it with a book in the other hand. Simply put it is a seasoned version of the regular dosai but its taste and flavors are amazing. My mother’s version, of course, did not have sesame seeds but I put it in to meet the ‘Y’ requirements of this mega marathon. It is an easy dosai to make but also gives you a break from the same old regular dosa and hardly needs anything on the side to go with it because it is so flavorful by itself. Crisp on the outside and soft on the inside, it is an amazing dinner or a lazy weekend breakfast. The best thing of all is that it can be customized to each person’s individual tastes thereby making it awesome for all. If you do not want it too spicy then you can omit the green chillies. You can omit the chillies altogether for kids. You can add other ingredients like ginger, onion, etc. Ultimate, how crispy and irresistible this dosa looks. Omg, my mouth is literally watering here. Cant take my eyes from your clicks. Too delicious and super nutty dosa. wow.. this dosa looks so yum and even interesting and unique for me.. Thanks for sharing for such a beautiful recipe. This reminds me handva. Adding sesame seed in dosa surely gives a kick to tastebuds. Looks so delicious. I loved this addition and make a difference. I am glad you picked this Sesame Seed Dosa for Y ! What a beautiful take on it , it’s breakfast time and I am drooling over this Dosa . Love the way you have made it , a little curved . Excellent ! OMG, that dosa looks awesome Sowmya. With some coconut chutney I will be in heaven. This one is surely very new..and nice to know about your mom’s liking of this..the toasted sesame seeds will have given a good taste overall right! Loved this. I make a similar version but with different batter. Your using dosa batter looks yum and delicious. Will surely try this out. This sounds likem y kinda dosa! I am a huge fan of sesame seeds and that topping is something to die for! Super pick Sowmya!! I am an absolute sesame seed lover and how did i not think about this before. I am going to so try this seasoning on my dosai next time I make some.